“Sir, I am in deep trouble.. you’re the one I am sharing this with because I know you are understanding.. I am not yet ready sir,” read the text message my former student Brent (not his real name) sent me. Then Brent asked me if I know any abortionist they could go to. I was shocked. Part of the subject Sociology 1, I teach Family Planning to my students, and because I believe in free, informed, and responsible choice, I present both the natural and artificial birth control methods. 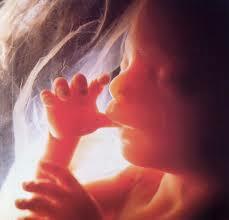 But never have I encouraged abortion, fully aware of its risks and its ethical and legal implications. In fact, I always tell my students that If anyone of them unwillingly gets pregnant or impregnates anyone by chance, I will take it as my personal failure as a teacher. I tried to talk to Brent against resorting to abortion, but he was firm and resolute. He and his girlfriend have talked about it seriously and there is really no way, and giving birth to the baby is no longer an option for them. He said they want a medical doctor to perform the procedure to make sure it’s safe, and he asked me again if I can recommend anyone. I don’t know any doctor who performs abortion, I told him, and even if I do, I would not make any recommendation. And what self-respecting doctor would perform abortion here in Laoag City? But I assured Brent that I am not judging them as persons despite what they were planning to do, for I am sure they have really given the matter a great deal of thought leading to their firm conviction that abortion is the only solution to the biggest problem they have had to face in their teenage lives. I assured him of my prayers. He reminded me that the matter is confidential. Matilda Ricardo Mandac, 63, is a truly powerful woman, and it’s not because she has stayed and worked at the Ilocos Norte Provincial Capitol, and has seen 5 governors in a span of over three decades. 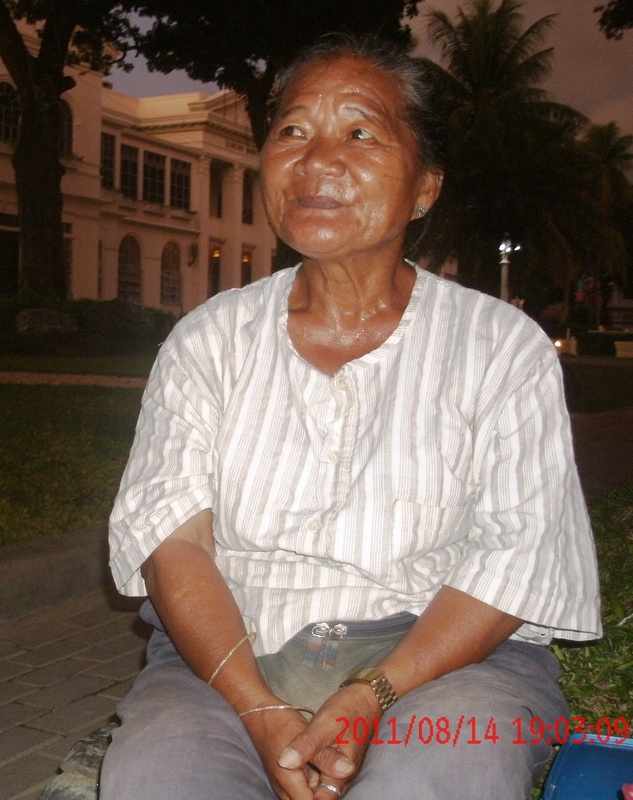 Nana Gretchen, as Mandac is popularly known (it is said that a tricycle driver named the lady, for reasons unknown to her, after actress Gretchen Barretto), has been selling cigarettes and snacks at the vicinity of the Capitol since 1980, during the term of Governor Elizabeth Marcos Keon. Over the years, she has endeared herself to a lot of people. A former governor once regarded her as “anting-anting ti kapitolyo” (amulet of the capitol). When she still had a small stall inside the perimeter fence of the Capitol, Nana Gretchen had gross sales of around three hundred pesos a day, from which she had a net income of less than fifty pesos. However, when the Capitol had a major facelift last year, the fence had to go, and she was displaced. Today, she sits in front of the Dap-ayan, a food center near the Capitol. Left without a stall, she carries three bags: one bayong contains a couple of cigarettes packs she sells, another is filled with empty plastic bottles she gathers and later on sells at the junk shop, while a third one—a shoulder bag—contains other personal effects. But she does not really have a lot. Not now when her daily sales have fallen to below a hundred pesos, as no one, except her old clients, knows that she is selling cigarettes. She brings out her wares when someone buys, and keeps the container immediately after. She scrambles when rain comes as she does not have a shade. She owned a broken umbrella, but lost it. Nana Gretchen used to live with relatives in Brgy. 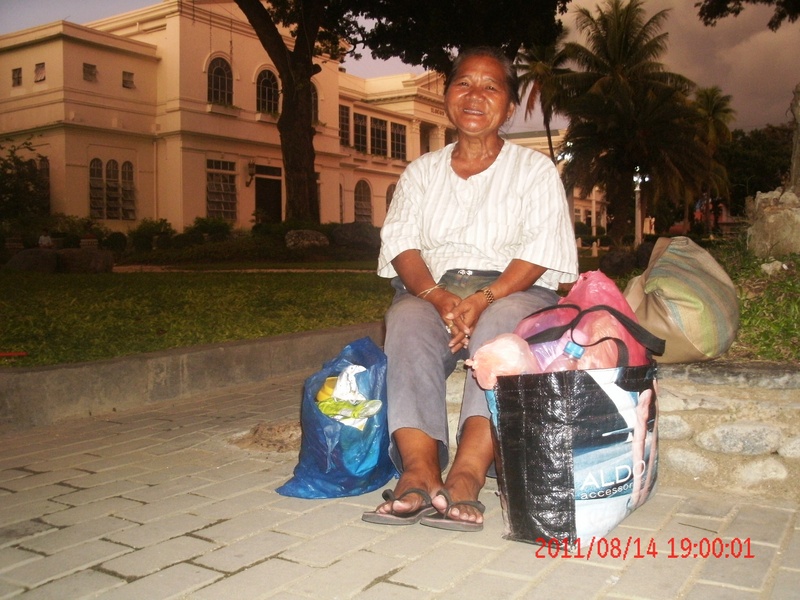 4, Laoag City, but was displaced by maternal kins in 2004, leaving her homeless. While she tried to seek help from the Public Attorney’s Office, she could not pursue the claim in the absence of a land title. Efforts to negotiate with her relatives failed. And so Nana Gretchen stays at the vicinity of the Capitol, whole year round, and that includes cold Christmas Nights and New Year’s eves. She would take daily baths at a faucet in an inconspicuous part of the Capitol garden. Note, dear karikna, that it is not at all a public scandal as she does it at 3:00 a.m., when almost all of us are in deep slumber. And with her clothes on. Nana Gretchen looks neatly dressed, but don’t get confused. With only two sets of clothes—blouse and slacks—she uses each pair every other day. It is not unusual that her clothes won’t dry enough, so she would end up sporting a wet outfit. Buying ten pesos worth of Pan de Sal at Town Bakery every morning, the store is kind enough to pour hot water on her coffee cup (actually a reused plastic container of instant noodles). A sachet of instant coffee costs her five bucks. When her purse allows it, she would have budget lunch at a carinderia. For dinner, what dinner? She spends the long nights with an empty stomach eagerly waiting for next morning’s pan de sal. Living in the streets comes at the cost of safety, but we already know that. And I am not only talking about typhoons and other calamities that she has to contend with. Nana Gretchen has been mauled by a mentally deranged man five times already, and counting. Her head would ache with the man’s powerful jabs, but Nana Gretchen is thankful the injuries she has sustained have not warranted a trip to the hospital. She has not, in fact, been hospitalized all her life, and thank God. But, at her age, one could not help but worry how she would cope in the face of a serious disease. In the dark corners where she spends the night, mosquitoes abound. And it just takes one bite from a dengue vector to send anyone, rich or poor, to harm’s way. Year 1987 was a particularly trying year for Nana Gretchen. In June, she gave birth to her only child Lucky Marjorie. But the baby girl was born prematurely and lived only a few minutes. Three months after, her husband Dominador was murdered. Those two deaths in a year punctuated her chance of belonging to a family. Lone child of Simeon, a farmer, and Guillerma, housewife, Nana Gretchen is a product of a dysfunctional home. Her parents, now both deceased, parted ways when she was a baby. With her mother suffering from a mental ailment, she was then left in the care of an aunt in Dibua South, a barangay in the outskirts of Laoag City. Her aunt saw her through grade school. Nana Gretchen has to be strong, and it is not a choice but an imperative in the urban jungle where she lives. Maybe this is the reason why some people get the impression that she is “mataray,” an impression I also had before I talked to her. And so while hers is one of my dream interviews, I dilly-dallied in doing it. But then I finally found myself one afternoon sitting a few meters away from her in front of the Dap-ayan. Looking at her, I felt intimidated. While I have done interviews with people of prominence, I was clueless how to approach the lady. Noticing my stare, she responded with a warm smile. What a joy! It did not take long before I warmed up to the lady, and, before I knew it, she began talking about life. The reason I am drawn to Nana Grechen is that, unlike Christopher Lao—the bratty UP alumnus who blamed government for his failure to realize that his car is not a submarine that can traverse deep bodies of water—Nana Gretchen does not feel that anyone, her government included, owes her anything. Not demanding help, she just quietly strives to earn a living for herself. All that she has formally claimed from government is a senior citizen’s card that she does not really find any use for. As for Governor Imee Marcos whose renovation project consequently affected her livelihood, Nana Gretchen only has respect and admiration. She concedes that the Capitol lawn, without the fence and her stall in it, looks better. “Personal sacrifice for the public good,” is a principle she understands more than most politicians I know. The Dap-ayan is also expected to be renovated soon, but that is another problem she wants to face on another day. Her toothless smile may conceal it, but I know how difficult it must be to be in her shoes. My heart breaks when I see old people live in miserable conditions. People who have toiled all their lives deserve the pleasure of simply enjoying the good life—say, play mahjong and bingo while waiting for pension, or, for the religious, like my mom, spend as much time as they want in church. Yet Nana Gretchen harbors neither bitterness nor envy. And no, not pride. While she does not beg, she would not refuse a sandwich when offered by a kind stranger. “That kind of fulfillment is something that I envy. I wish I have that kind of bliss and serenity,” says my friend Jun during a few rounds of SanMig Light on a Friday night, and I couldn’t agree more. Nana Gretchen reminds us of sheer pleasure in little things—of owning an umbrella, of wearing dry clothes, and of simply being able to take a bath in naked glory. At the end of the interview, I gave her a tight hug, and I felt power and wealth that could only come from the inside. The Roman Catholic Diocese of Laoag, established in June 1961, celebrates its Golden Jubilee this year, and I should feel excited. This must be something big and meaningful. 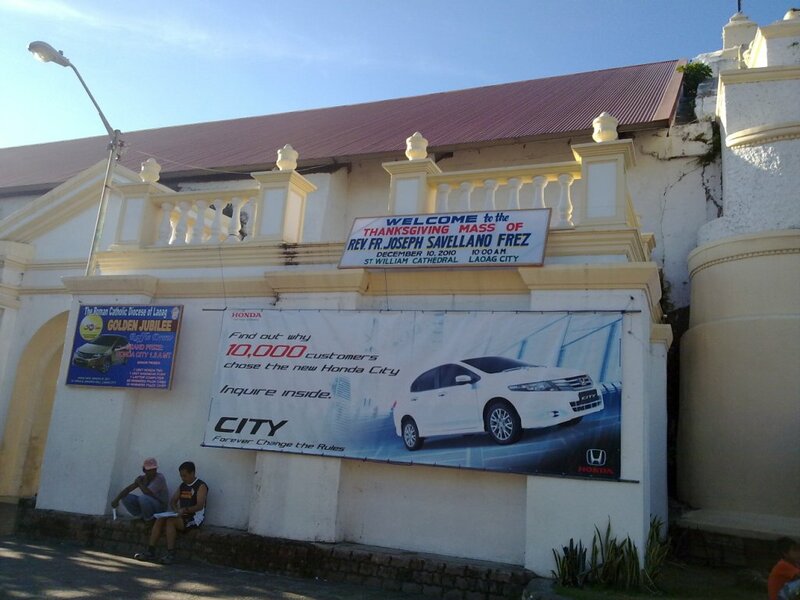 After all, Ilocanos are a deeply pious lot and we, as with the rest of the nation, are predominantly Catholic. But I feel uneasy, dear karikna, because of certain circumstances that surround the celebrations. I came to know of the Church’s golden jubilee in a rather odd way. 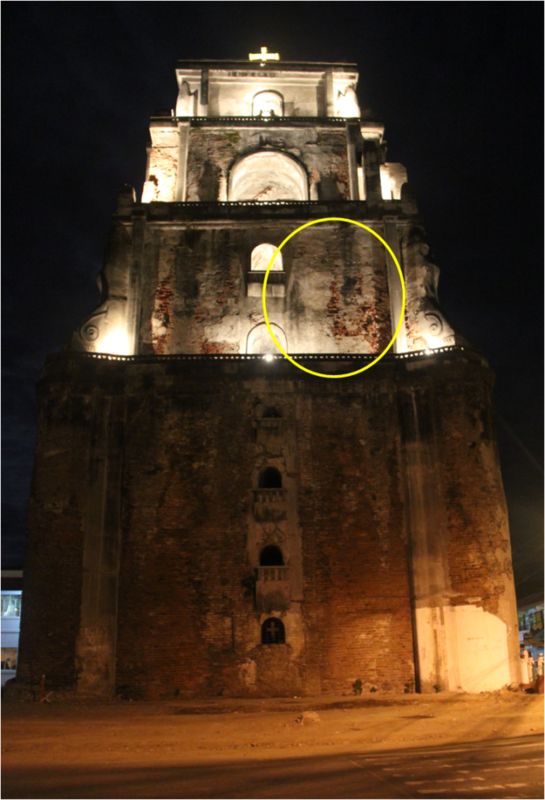 In November last year, Luvee Hazel Calventas-Aquino, a friend and colleague in the university, expressed to me her discomfort over a tarpaulin streamer that was hung very conspicuously near the side entrance of the St. William Cathedral in Laoag. Most churchgoers take the side entrance, and so it is very difficult to miss the streamer. “Why post it there?” Luvee asked. And it is not only Luvee, many other well-meaning parishioners shared the same sentiment.